So I have both bishops + 4 pawns = 6.5 points + 4 points = 10.5 points. The opponent has a queen + 1 pawn = 10 points. I know how to challenge a queen with 2 rooks but not with 2 bishops supported with pawns. That's why I played to get the draw and I got it by claiming repetition. Has any of black or white a way to force wining or its a draw? Does comparing with points matter here, 10.5 vs 10? Black is winning handily from the diagram position, and has a fairly straightforward strategy going forward: force the b-pawn's advance to b2 with the support of the bishops (starting with 1...Be6 to gain control of the b3 square), and then slowly push for a new queen, making use of the facts that (1) White must always keep guard over b1, and (2) Black has plenty of material to shield from a potential perpetual. 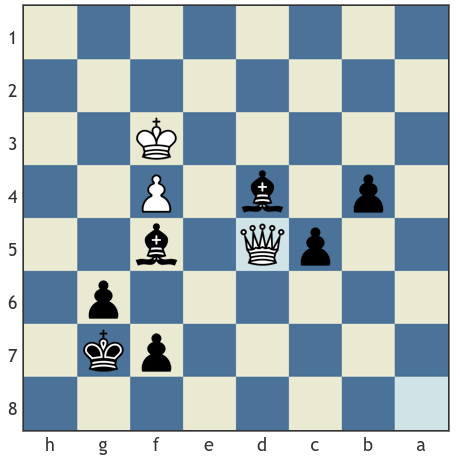 The following is lightly annotated over the first few moves, and from move 5 on is just one line illustrating how Black can make steady progress with nothing to fear from the White queen. 12.Qb7 Be5+ 13.Ke3 f4+ 14.Kd2 Kg6 15.Qg2+ Kh5 16.Qh1+ Kg5 17.Qg2+ Bg4 18. From here, white can go on with some checking sequence, but it looks to me that black will be able to escape a draw by perpetual check eventually and promote. The piece point scoring systems are subjective by default and also often heavily dependent on the position and number of pieces left. I do not think exact point comparison is useful in this particular case, however. The position is roughly equal, yes - black just happens to have his king safeguarded from checks and two well supported, passed pawns and thereby excellent winning chances. Suppose though, that both black and white f-pawns were gone. Point-difference-wise nothing has changed - 9.5 to 9 now, but it would be much more difficult, if not impossible, for black to force a win, since his king is now much more exposed to checks. What I mean, is that with this same material imbalance (Q+P vs B+B+4P), one could easily set up positions with any possible end result as an outcome - all depending on how the pieces are positioned and coordinated. There are also many fortress scenarios in queen vs rook/minor piece(s) endings, where the point system can be misleading. Suppose, for example, the c and b pawns were to be removed - now, in theory, white is ahead - 10 to 8.5 points. I haven't checked, but black should be able to set up a fortress and hold a draw despite the material disadvantage. Not the answer you're looking for? Browse other questions tagged endgame draw bishop-pair or ask your own question. Is this endgame a draw (hacked - TestViking)? Is this 2B vs. N endgame won for the bishops?